Oh, my, that looks good enough to eat! we say of a pretty ornament. That looks so good I can taste it! 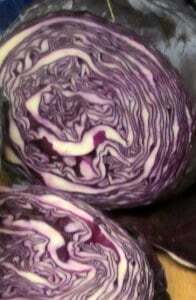 Red cabbage, of course, isn’t really red, it’s deep purple. And it swings from red violet to blue violet, depending on the acidity of the dish. 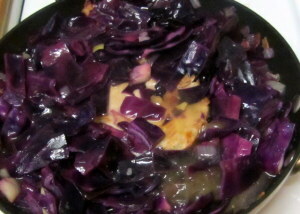 (If you have ever wondered why every recipe for red cabbage seems to have vinegar in it – the acid pulls it red.) 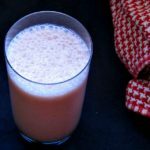 I did put vinegar in this, but not enough, obviously, for the color, once I’d also added some alkaline ingredients – and then it tasted so good I decided against another jolt of sour. I sliced an onion, and sauteed it in the bacon fat until soft. 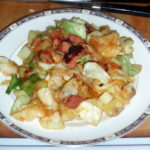 While it cooked, I cut up, um, a chunk of cabbage. (Isn’t that a pretty pattern?) This is a huge head of cabbage… I’m really probably going to eat a little more, then cook up the rest of it and freeze it, rather than eat red cabbage every other day for two weeks, while it is still fresh. 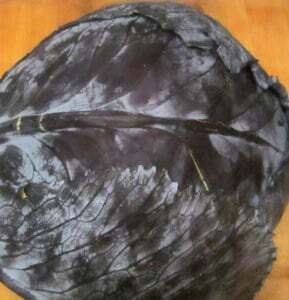 But now, I whacked off a chunk by eye – and after putting it in the pot realized I probably should have weighed it… I’d say, though, that it was probably about a quarter of a more typical head of cabbage – and close to half the size of the much smaller heads I usually see of red cabbage. 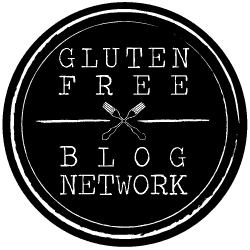 Anyhow, I chopped it up – maybe about 2 or 3 cups, chopped? Then I put it in the pan, and stirred it around to coat with the bacon and onion. 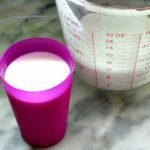 I added 2 tablespoons of vinegar – and I think I’d do more, next time (I call for more, in the recipe) – and some of the turkey broth I had in the fridge. I covered it and let it simmer 5-10 minutes – at this point, the goal was basically to soften it enough that I could put the meat in. After the cabbage had softened and cooked down a little, I pushed it aside, put the chop in the pan, covered it with the cabbage, and added more broth. I covered it, left it over low heat, simmered 20 minutes, turned it over, gave it another 20 minutes. OK, so at this point, I removed my pork chop. Now, if it were a boneless chop, or 2 smaller center cut ones, or whatever, I could perfectly well just serve them as is, with the cabbage on the side. But I already mentioned the problems with splitting one of these. Besides, I now had a lavender pork chop… And… it just looked funny. 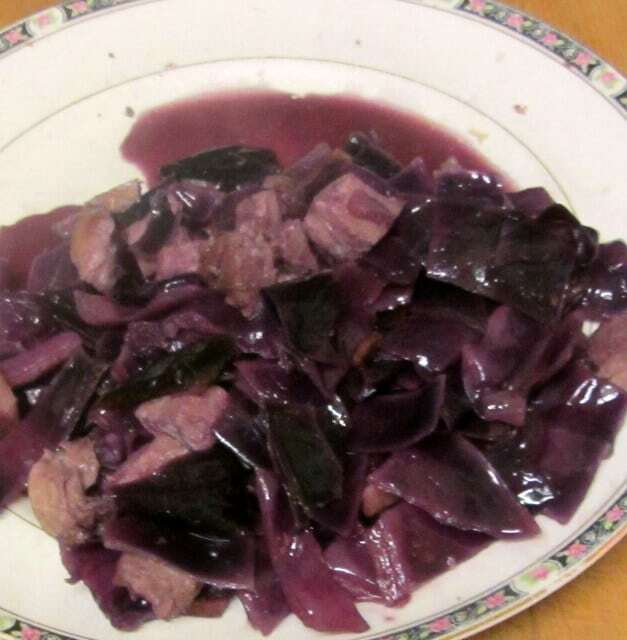 So I cut it up in small bite sized pieces and hid the evidence – buried it in the cabbage. Which, I was noticing, was a rather bluer violet than I’d planned… but I tasted it, and it was so good, so sweet all by itself, I decided against another jolt of acid for color. 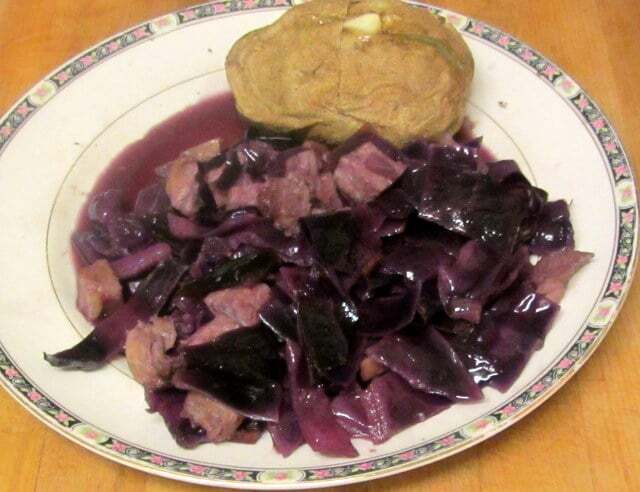 I just microwaved a couple of potatoes, and served the pork and cabbage with them. 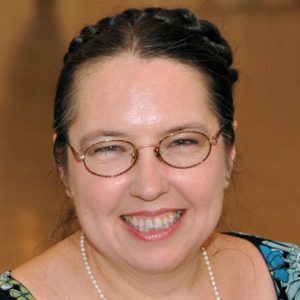 (I did think of mashing – but the knowledge that I’d get lavender mashed potatoes from the liquid made me hesitate. I don’t even really want pink mashed potatoes.) But, I say it again, it tasted so good! 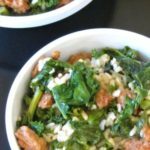 OK – This recipe will work fine with green cabbage – skip the vinegar. 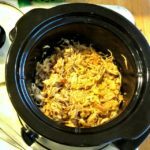 Many red cabbage recipes, like the one I posted more than a year ago, balance the acid with fruit for a sweet and sour – apples are particularly good for this.And you can, of course, just do the first few steps and leave the meat out all together. Many variations, all good. Cook bacon in large frying or saute pan until fat melts. 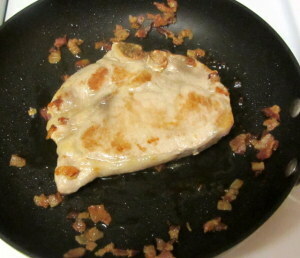 Brown pork chop in the fat, then remove and reserve. 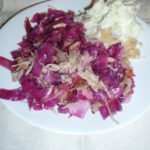 Saute the onion until softened, then add cabbage. Stir it to coat, then add vinegar and a splash of broth. Cover and cook 5-10 minutes until it starts to soften, separate, and cook down. 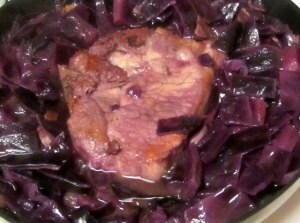 Return pork chop to pan, cover with cabbage. Add broth to cover meat. Cover pan. Simmer 20 minutes, turn pork chop over, simmer another 20 minutes. Remove pork shop. 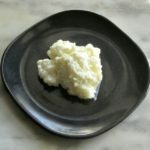 Cut into bite sized pieces, if desired, and return to pan, stir it together.